Birdcage Press was created by Wendy O'Reilly in 2000. Prior to that she created games for her 3 young children as a way to make learning more fun. She made the games with her children by pairing their favorite card games with different periods of art and history. Each game had a book to go along with it. Birdcage press games are now sold in museums, fine gift, book and toy stores. They offer a wide selection of games and other products to help bring history, art and nature alive for the entire family (both young and old). To say we LOVE games is an understatement. We have entire days where all we do is play educational games. 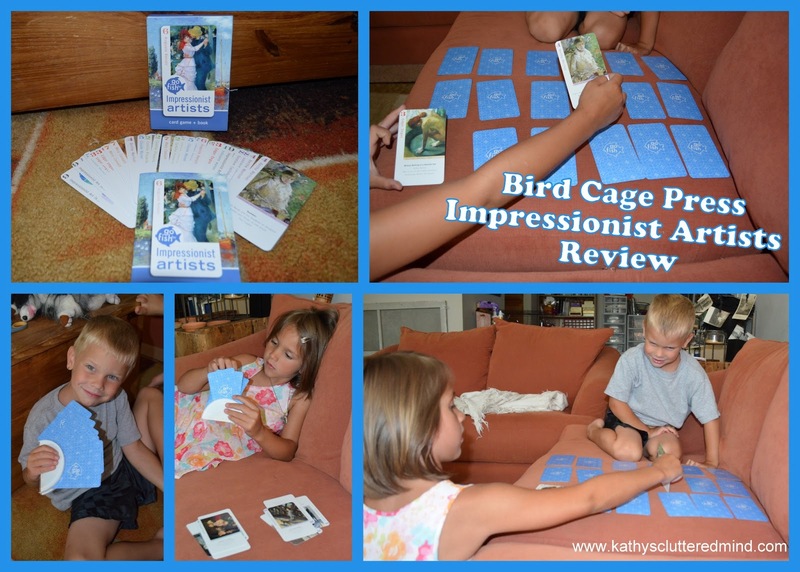 So I was thrilled to review Impressionist Artists Go Fish from Birdcage Press. I firmly believe that a lot can be learned through a fun educational game and many times the children don't even realize they are learning...shhh don't tell them! 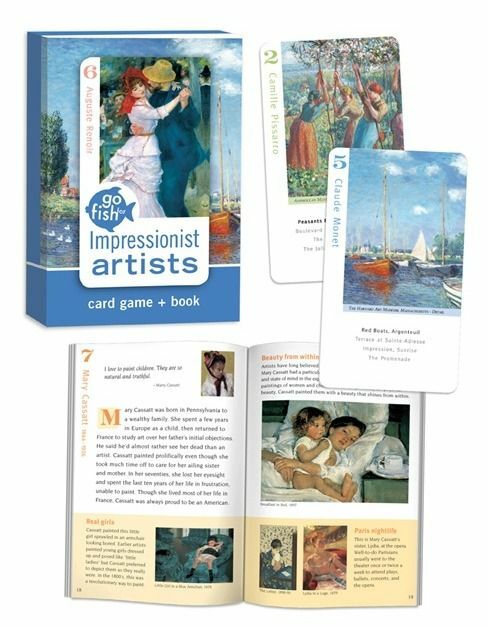 The Impressionist Artists Go Fish card game includes 36 playing cards + a 28 page fact book. The cards are stored in the very sturdy cardboard box and the booklet fits nicely into the cover of the box which is secured by a magnet and flips open. When you flip the cover open the box has a rectangular cutout which displays the artwork from one of the cards, just like a picture frame. This game is recommended for children ages 7 years and older however my almost 6 year old was able to play the game very easily as well. I would actually say 5 years and older could play this game (more on why below). The game introduces children to 8 great Impressionist artists. The cards are made from glossy, thick cardstock and are very large (3 inches x 5 inches). The nice large size makes it very easy to see the pieces of artwork and descriptions on each card. However it makes them hard for little hands to hold. But we remedied this issue with a quick 5 minute craft (more on our nifty card holders below). Each card has a colored number on the top left hand corner along with the artists name in the same color. This made it easy for both of my non-readers to play the game without getting frustrated. When they asked other players for a color or number I would chime in and tell them the artists name. Eventually they started remembering the artists names for each color/number. Various learning skills including memory, concentration visual processing, strategic thinking, numbers, colors, reading and art appreciation will be learned while playing this game. 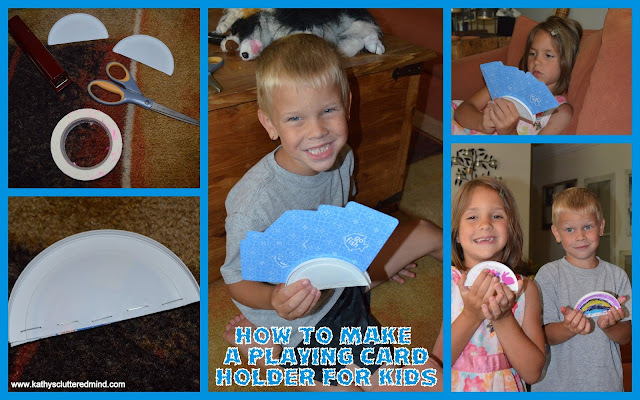 The cards don't just have to be used for Go Fish. And if forget how to play Go Fish like I did, don't worry there are instructions in the booklet. There are other recommended games in the booklet as well like Memory and Art Pairs. Each of these games was lots of fun. Though we didn't have a chance to squeeze it in the cards and companion booklet would be a lot of fun to take on an art museum fieldtrip. I am thinking iSpy would be a fun game to play at the museum! We have an art museum membership and I know they have some impressionist artwork there so next time we go our cards are going along with us for sure. The companion fact booklet is an awesome bonus! It is filled with stories about the artists and the exciting times in which they lived. There is information about the artists lives, quotes, pictures, historical facts, information about art techniques and more in the booklet. On the inside of the cover flap are 3 fun questions to ask your children for a review after you read through the booklet. I probably sound like a broken record mentioning all our traveling in many of my recent posts but we are an on the go family and thus our review products often travel with us. This game was no exception. It was easy to transport and the kids had fun just looking at and discussing the artwork. Many of the Birdcage games have won awards and I can see why! The kids had a difficult time holding the cards so I whipped together a card holder made from recyclable materials. 2) Staple along the bottom (flat part). 3) Put a piece of masking or duct tape along the bottom to cover the staples. 4) Decorate with permanent markers or even stickers. My son thought they looked like rainbows so he made a rainbow on his. 5) Ta Da now the cards are easy for little hands to hold. Gwyn, "My favorite artwork is Racehorses Before the Stands because it has a horse. The games were lots of fun. I liked playing all of them." Rowyn, "My favorite drawing is Peonies in a Vase. The flowers are pretty. I liked the Go Fish game. I won." Click here for more Birdcage Press reviews from the The Schoolhouse Review Crew.